Violation of the rights of a human being and indifference in the face of suffering jeopardize the very existence of human society. The Holocaust is the most extreme example of such violations, and the greatest moral failure mankind has experienced. Confronting the Holocaust, as well as genocide, may contribute to understanding the importance of humanistic and democratic values, and help construct tools for making moral judgments. That is why courses on the study of genocide and the Holocaust have become part of the curricula of educational institutions in the United States and elsewhere. This book asks how the moral messages of the Holocaust and genocide can best be transmitted. The Pain of Knowledge deals not with historical events, but with possible ways of learning about these events and their significance. It attempts to examine and deal critically with some of the profound dilemmas at the core of Holocaust and genocide issues in education. The underlying purpose of this book is to expose the reader to sometimes antithetical, and at other times complementary, views concerning the teaching of these subjects, both in Israel and elsewhere in the world. This book will contribute to the teaching of the Holocaust and genocide, and encourage readers to examine these issues from a broad perspective. 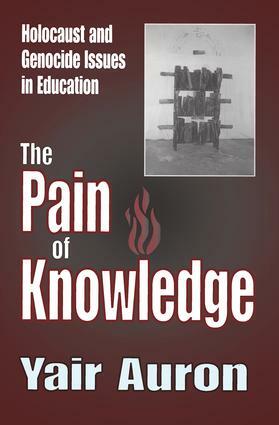 Among the subjects dealt with in The Pain of Knowledge are: how societies crystallize their collective memories; historical processes and changes in the teaching of the Holocaust in Israel during different periods of time; commemoration of Holocaust Martyrs and Heroes Remembrance Day; journeys of Israeli youth to sites connected with the Holocaust in Poland; attitudes of Israeli adolescents toward the Holocaust; attitudes of Israeli Arabs toward the Holocaust; general world attitudes toward the Holocaust; teaching of the Holocaust throughout the world; and teaching of genocide in Israel and elsewhere. Yair Auron is senior lecturer at The Open University of Israel and the Kibbutzim College of Education. He is the author of numerous articles and books on genocide and on contemporary Judaism, including Jewish-Israeli Identity and We Are All German Jews: Jewish Radicals in France During the Sixties and Seventies.